and restrooms were definitely the order of the day, and not necessarily in that order. Founded in the 1870’s after copper was discovered, Cobar has an extensive mining history and there are still 3 major mines in operation today. If we’d had time it might have been interesting to do some exploring but we wanted to get to Broken Hill and the weather wasn’t being kind; the wind was howling and it was freezing. In that wind the coffee went cold really quickly so it wasn’t long before we were back on the road and leaving Cobar behind. 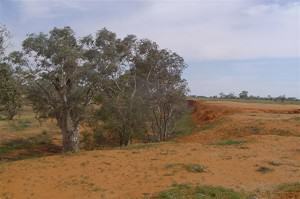 Roadhouse, approximately 296 kilometres (184 miles) east of Broken Hill, at about midday. The place hasn’t changed from the last time we were here, and that includes the restrooms. At best they could be called “rustic”, the door of the Ladies room still has a huge hole in it, and the Men’s room doesn’t have a door at all. At least the local Council has seen fit to install a rest room at the entrance to the parking lot. It’s only one of those roadside composting toilets but still a far better option to the other one. But, I suppose when it’s the only stop for hundreds of kilometres, one really doesn’t have much choice. A few years after our visit we learned that Emmdale Roadhouse had been sold and the new owners had embarked on a major upgrade. 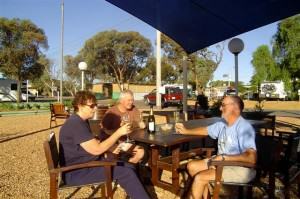 It now boasts a caravan park and new amenities. John and I look forward to returning there some day to have a look for ourselves. 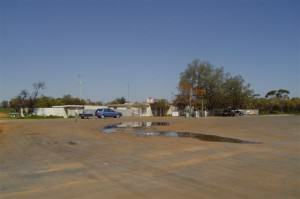 On our way again we drove through Wilcannia, a town with its own history and an interesting one at that. When the shops have windows boarded up with corrugated iron and all the private houses have bars on their windows and huge iron security fences surrounding them, it doesn’t make you feel comfortable about stopping. We didn’t. 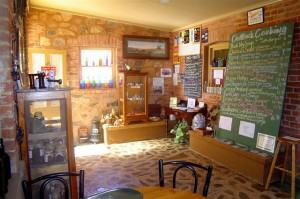 A brief stop for coffee and rest rooms at Little Topar Roadhouse and we were on the last leg of this day’s journey. At each of our stops I had suggested to John that he top up the fuel but he reckoned we were fine. Well, he “reckoned” without the headwind and we were 35 kilometres (22 miles) from Broken Hill when the car’s fuel light came on. I gave him “the look” and he wisely didn’t say anything; I think he may have realized that spending the night on the side of the Barrier Highway about a million kilometers from anywhere was not an option. 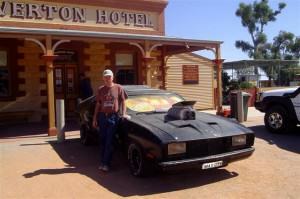 We pushed on and made it to Broken Hill but it was a close run thing; it took 81¼ litres to fill an 82 litre tank! Believe me, if we’d run out of fuel any options for John would not have been goods ones! We set up camp at Broken Hill City Caravan Park ([star][star][star][star_half]), grabbed our bottle of Two Tails bubbly for our first night ritual, and, along with our travelling companion, wandered over to the camp kitchen where we toasted the start of another adventure. But the breeze was cool and it wasn’t long before we returned to our vans and settled in for a quiet night. The wind abated only slightly during the night and I began to wonder if it is always like this here; there was a howling gale last time we stayed in Broken Hill. What a cold night! It was absolutely freezing in the morning. Are we sure this is the outback? My pre-conceived ideas of baking under the outback sun sank further into the red dirt with each gust of wind! 140 movies and television shows over the years, the most notable of which was “Mad Max II: The Road Warrior”. 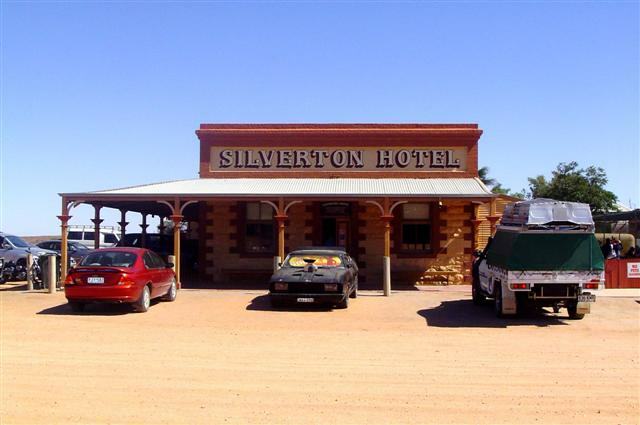 A full-scale replica of the car driven by Mel Gibson in that movie now stands proudly out front of the Silverton Hotel and is quite possibly, even probably, the most photographed car in Australia. And, of course, we had to do it too! How could we not? hotels in Australia, St Carthage Catholic Church, the public school, surveyors cottage, and gaol, to name a few. We spent some time being the typical tourists (yes, cameras hanging around our necks but I drew the line at a giggle hat!) and visited the Catholic Church which is undergoing some restoration, including gardens and vegetation regeneration. This old church was the scene of the wedding at the end of “A Town Like Alice” mini-series. One of the most recognisable buildings in Silverton, over the years the church has been home to several well-known artists. Silverton is also known for its art galleries, some located on a hill laughingly referred to as “Silverton Heights”. The first gallery we stopped at was the Peter Browne Gallery. Peter Browne, a true Aussie larrikin, moved into a ruin at Silverton and established the town’s first art gallery. 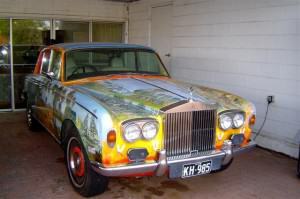 He’s always said that his paintings must have 3 special ingredients: humour, Aussie flavour, and emus. Yes, emus. There are big-eyed emus painted on everything, even his beloved Volkswagen Beetles! If rock jumps, it’s an earthquake, if rock is on the ground, the string is broken! terribly sweet and I think it is probably an acquired taste but I don’t know if it’s one I care to acquire. John enjoyed it and our travelling companion, Robert, was a bit “uh-uh” about it. John and I had had quandongs in South Australia years ago and quite enjoyed it so I guess it’s the way it is cooked that makes the difference. wall and we simply followed them, not knowing that we weren’t supposed to be there! That poor man almost had a fit when he saw all those people standing on the dam wall! Umberumberka Reservoir is 9 kilometres (5½ miles) west of Silverton. Completed in 1915, it has a catchment area of 407.5 kilometres (253 miles) but the average rainfall here is only 225 millimetres (9 inches). Near the parking area there are some picnic tables and a steam museum that has some interesting pieces of old equipment; they actually look like little silver flying saucers! Leaving the reservoir, we drove a little further west to where the black-top ends and the red dirt road begins and stopped here for a coffee break. 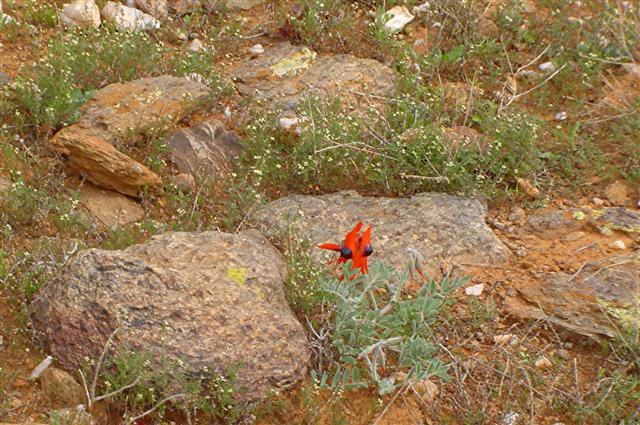 John was fascinated with the gullies and dry creek beds; the red earth contrasting with what little green vegetation there is has a beauty found nowhere else in the world. On our way back to Silverton we passed Mundi Mundi Station, a property that was the first station set up by European settlers on the Barrier Ranges in the 1850’s, and we stopped at Mundi Mundi Lookout. The view from there is breathtaking; hundreds of kilometres of . . . nothing. A vast emptiness that is desolate and beautiful at the same time. 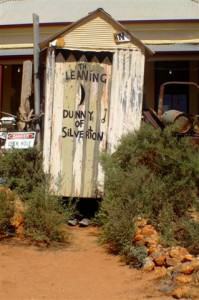 almost every aspect of life in Silverton’s heyday is represented here. It’s a step back in time! We also visited the historic courthouse that is now the War Memorial Youth Camp, before stopping at Penrose Park Campground. Established in 1937, the campground has tennis courts, children’s playground, and the bush golf course is really something to see! It’s not your typical PGA course with its clumps of Spinifex, dead tree stumps, and fine red dirt but that certainly didn’t deter the few obviously die-hard golfers we saw there. amazing and brilliant as his paintings and the garden area at the Gallery contains several of them. 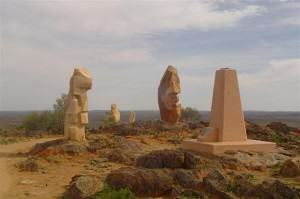 Many more can be seen throughout Broken Hill. While at the Gallery we met a lady named Mary, one of the volunteers there, who is an absolute walking encyclopaedia, not only about the art but also about Broken Hill, its history and surrounding areas. She’s lived there all her life and there’s not much about the place that she doesn’t know. In 1844, the explorer Charles Sturt saw and named the Barrier Range. The range was comprised of a number of hills that appeared to have a break in them and Sturt made reference in his diary to a “broken hill”. The town had its beginnings in 1883 when a rich vein of silver was discovered on this “broken hill” by a boundary rider named Charles Rasp and it wasn’t too long before folks were calling it The Silver City. 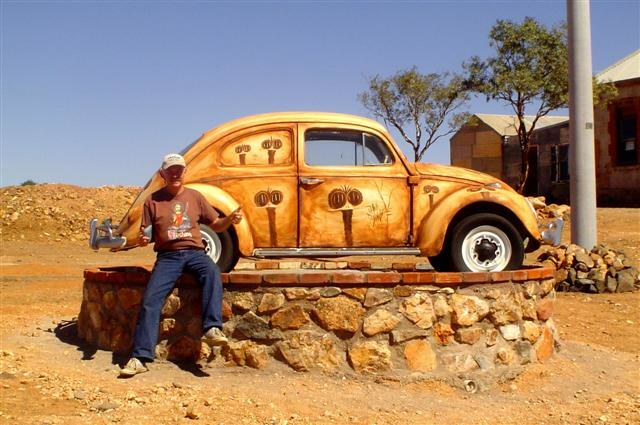 The town has been, still is, and probably always will be dominated by the mining industry but today artistic creativity is actively encouraged and the town promotes itself as a tourist destination in a bid to become less reliant on the mines. Mary also told us about the “Battle of Broken Hill” when the town was the scene of the only enemy attack on Australian soil. Two Turkish sympathisers attacked a party of picnickers on New Years Day 1915, 4 months before Gallipoli. Four people were shot dead and seven more wounded before the attackers were, themselves, shot dead. fortune in this town. There is no place in Broken Hill where you can’t see the mine but the Joe Keenan Lookout is definitely the best place to get the most outstanding views. 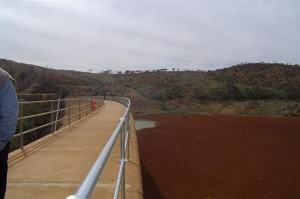 Named for the man who held the presidency of the Barrier Industrial Council in Broken Hill from 1969 to 1985, it offers views of the town and the mine dumps as well as containing several information boards. The late afternoon had turned quite cold and we decided to call it a day. 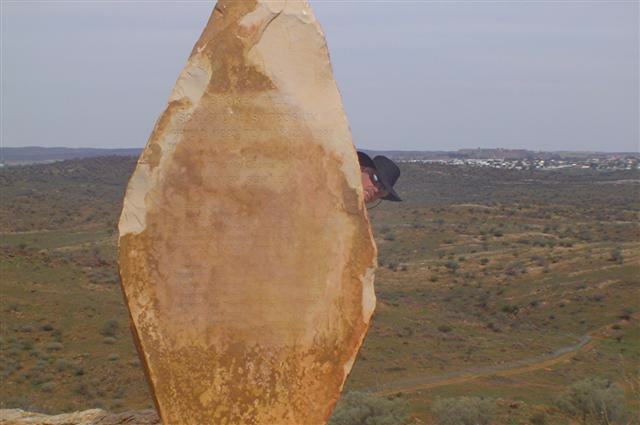 There are many things we would like to see in Broken Hill and we will when time permits but for now it is time to say a reluctant farewell to this amazing place. We returned to camp as the sun was going down and after much discussion, mainly centring on the fact that I didn’t want to cook that night, decided on dinner at Broken Hill’s Legion Club. It is a very pleasant club and the food tasty and inexpensive but, then again, as long as I didn’t have to set foot in the kitchen before or after the meal, it was bound to be good! John did suggest dropping a line in somewhere but I told him I’d like to eat tonight! It had been a long day and we had quite a drive ahead of us the next day and so after dinner we settled in back at camp for an early night. We learned a great deal about this town during a brief stay here, and one of things we discovered is that Broken Hill is in a fruit fly exclusion zone and it is illegal to bring fresh fruit and vegetables into the area. There are several bins along the highway where you can dump the produce but the best thing is not to bring it with you to start with. The fruit fly is a nasty little pest that has the potential to destroy our fruit export industry. 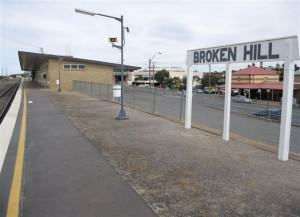 But Broken Hill has much more than meets the eye. From the history to the art galleries and even tours of the mine, it’s a place you can come back to again and again and still not see all there is to see.